Looking over your shoulder for the better part of two-and-a-half millennia, waiting for the other shoe to drop, is probably not the best way to cope with Mother Nature. 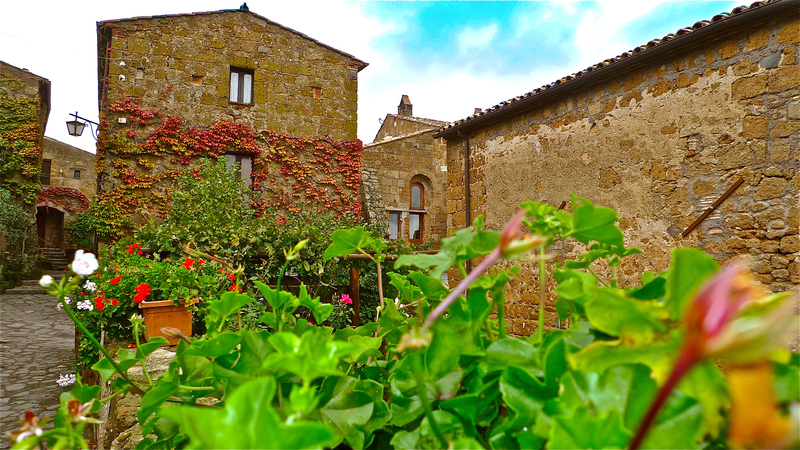 But, that’s exactly what the tiny village of Civita di Bagnoregio has been doing since the innovative Etruscans discovered a rocky peak far from the madding crowd – where only eagles dare – and decided to call it home. Surviving more than 2,500 years of wind and erosion, this tightly knit community struggles to ward off the “Grim Reaper” as it sits, strikingly, atop a pinnacle of brittle volcanic tuff that overlooks the Tiber River Valley in the province of Viterbo in the Lazio Region of Central Italy. Not surprising, Civita is referred to by Italians as il paese che muore (the dying town). Admired for its architecture, Civita is in constant danger of total collapse as its edges slowly erode and fall off, leaving the buildings built on the plateau to crumble. Scratching their heads, geologists have led the way in efforts to shore up the village with steel rods to prevent further decay. Of all the Italian hilltop towns, Civita is quite impressive on a very small scale and billed as uno dei borghi piu belli d’Italia (one of the prettiest villages of Italy). Lesser known than more popular – and safe – medieval hill towns and cities, Civita is one of the finest examples of a true step-back-in-time as the modern age just looked the other way and simply passed it by. 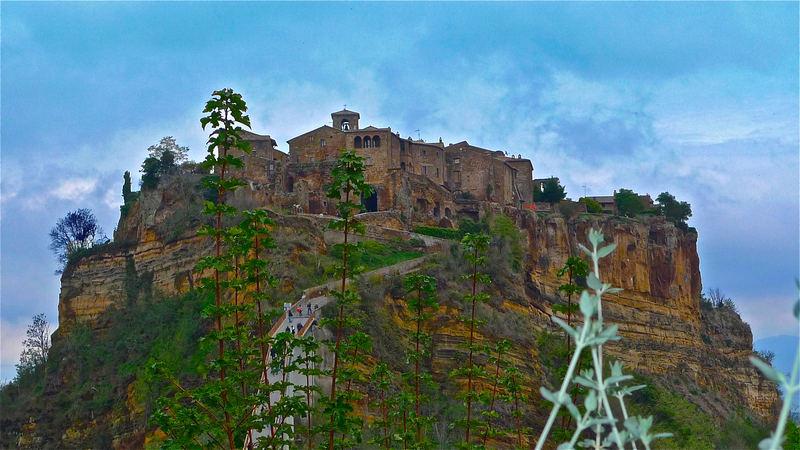 Its relative isolation has actually helped Civita survive for as long as it has. 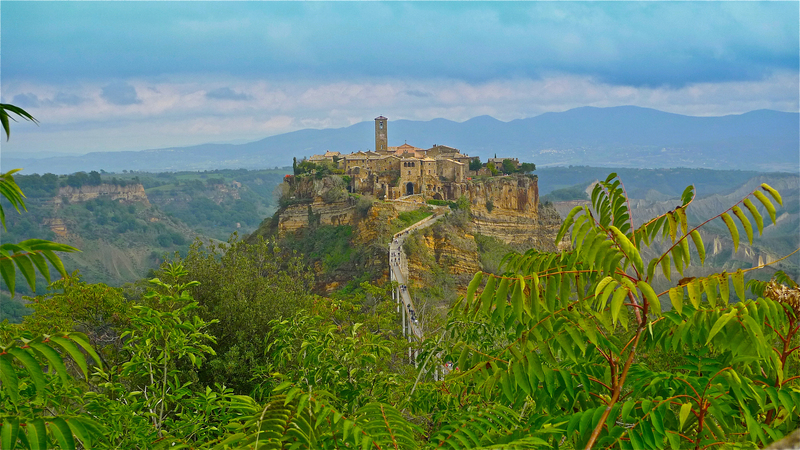 Lying off the beaten path has kept the still-standing structures pretty much in tact, but, if left unregulated, the increase in foot traffic from squads of curious day-trippers – like myself – could actually send Civita over the edge, literally. As a matter of fact, in 2006 the World Monuments Fund placed the village on its 100 Most Endangered Sites list, citing the constant threat from erosion and unregulated tourism. This town on life support owes its unaltered condition simply to its topography. Because of its precarious situation, Civita, just like a slow death, has watched its population dwindle down to a select few: about 12 residents in winter and a “booming” summer population of just over 100. 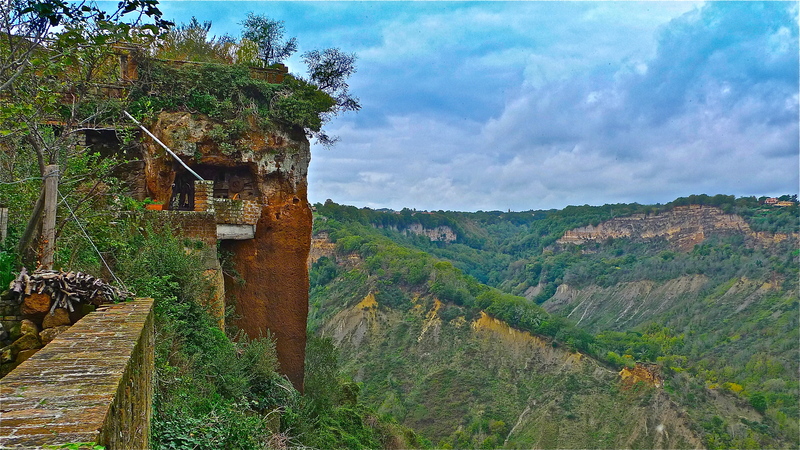 Teetering on the brink of extinction from its perch high above the river valley below, Civita used to be connected to its bigger and busier sister town of Bagnoregio. That all changed when the earth bordering the two communities wore away, leaving a deep, vast canyon to traverse. A footbridge that spans the great divide is the only reason the “dying city” still has a pulse. Today, provisions are brought up on foot, scooters, pony tractors, and even a donkey or two. Along with its topography, architecture and storybook charm, Civita is the birthplace of its most famous son, St. Bonaventure, the 13th century Franciscan friar and noted theologian-philosopher. 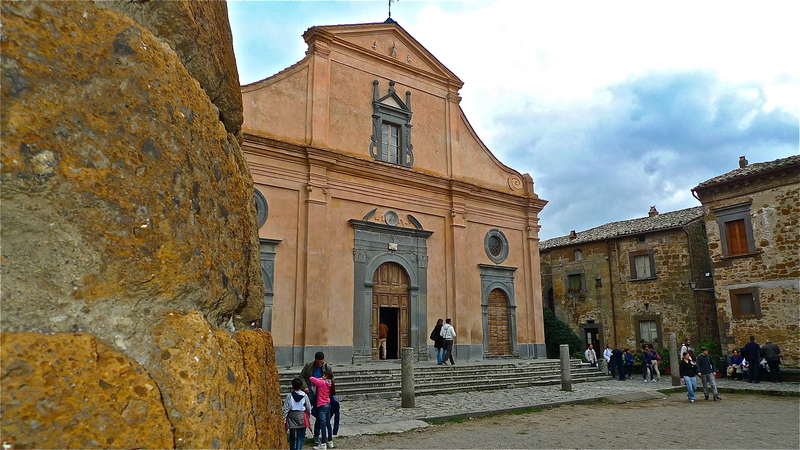 His home is long gone – eroded away, no doubt – but the basic layout of Civita survives, with a church as its centerpiece in the small main square, Piazza del Duomo. Ownership of this house of worship has switched hands over the centuries: an Etruscan temple, then a Roman temple and, finally, the Catholic Chiesa di San Donato. Despite the ever-present death knell underneath the masonry, Civita remains transfixed in several bygone eras. There are no lists of local events or attractions, organized orientation tours, museum operating hours or even a billboard to draw attention. An artist’s and photographer’s dream come true, the town is a living snapshot or portrait of the Etruscan, Roman and the Medieval eras. 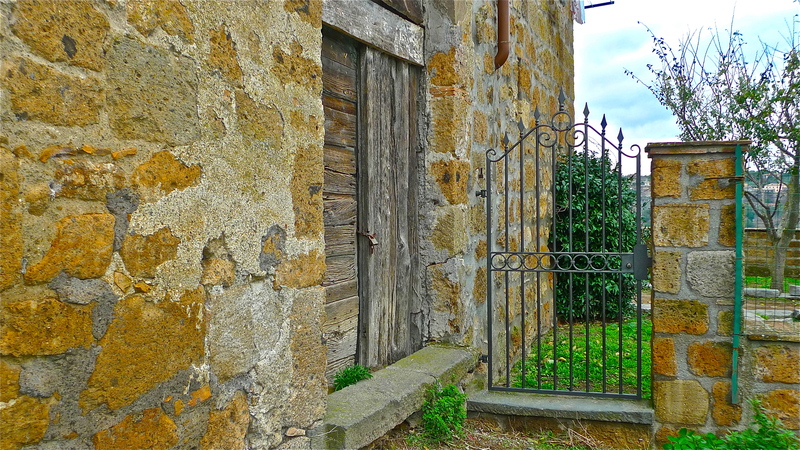 Each step along the cobblestone paths holds a surprise. 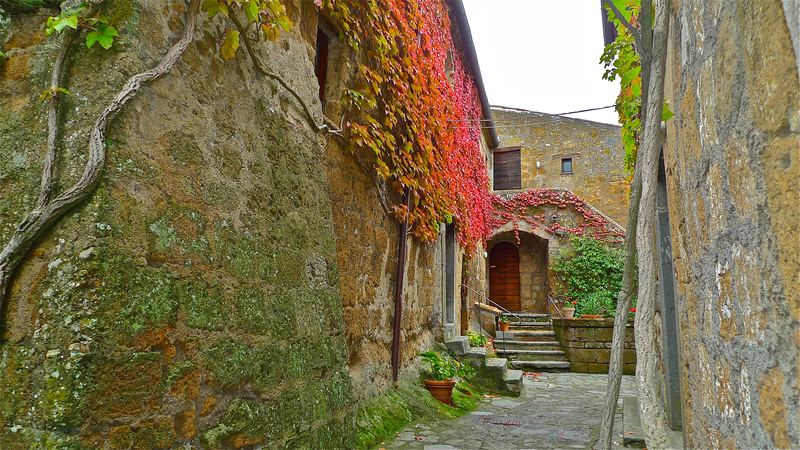 Turn the corner and you’re hit by ivy draped walls and arches; potted flowers dotting balconies, porches and window sills; and, the ever-changing color of the stone walls and houses as daylight glides across this nativity scene-like village. 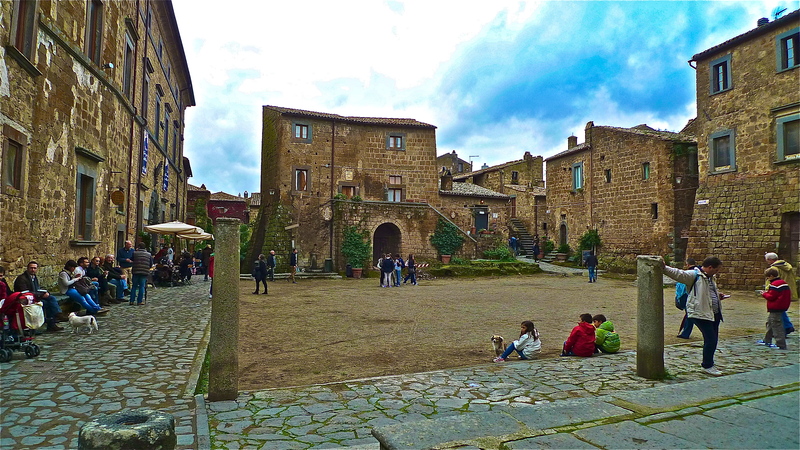 Civita di Bagnoregio, one of the Bel Paese’s prettiest, but most fragile, hilltop villages. If not already noted, this “endangered species” should be placed high on your travel bucket list, if not in the prestigious number-one position as it rightly deserves. But, don’t wait too long. The days of il paese che muore are numbered. It’s just a matter of time. Tom…. such a wonderful post. I want to go.. and I promise to tread very lightly…. QEIII – Thanks for the thumbs up. Yes, tread lightly when passing through this village on the edge. Quite a sight to see it up close. I love where they put their pans, utensils, plates and other cooking tools. Aaah I see. Nice to see it still. Great photo to keep. G-Chic – Glad you enjoyed my take on this picturesque berg. Quite impressive. About that olive press, that’s some piece of machinery. Don’t let my post steal your thunder; be my guest and post about the press and the delicious bruschetta. ADinP – Thanks for stopping by and giving a “thumbs up” for this post. 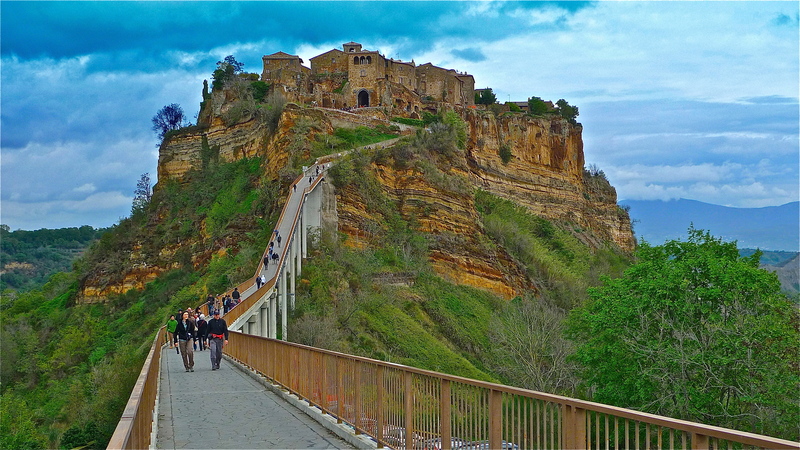 I’m sure Civita will still be around when you decide to visit. It is a breathtakingly beautiful village Tom. A wonderful post! D-Moon – Thanks for reading-viewing the article. Glad that you enjoyed it. Did you view the video at the bottom of the article? I hope you did. 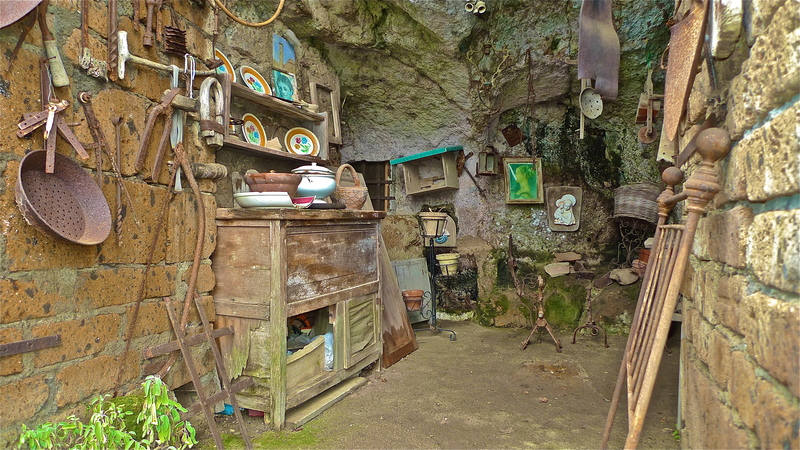 One of the shots shows a cavern with farming implements and some plates, vases, etc. This is such a lovely place. I’ll bet if the lights are off at night, the panoramic view is amazing – especially on a cloudless night! Amazing post =) Thanks for sharing it with me! 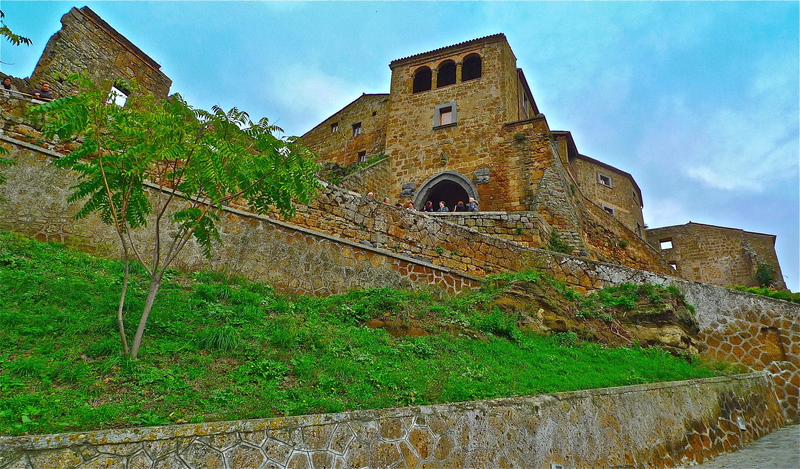 Now I want to visit Civita di Bagnoregio even more! 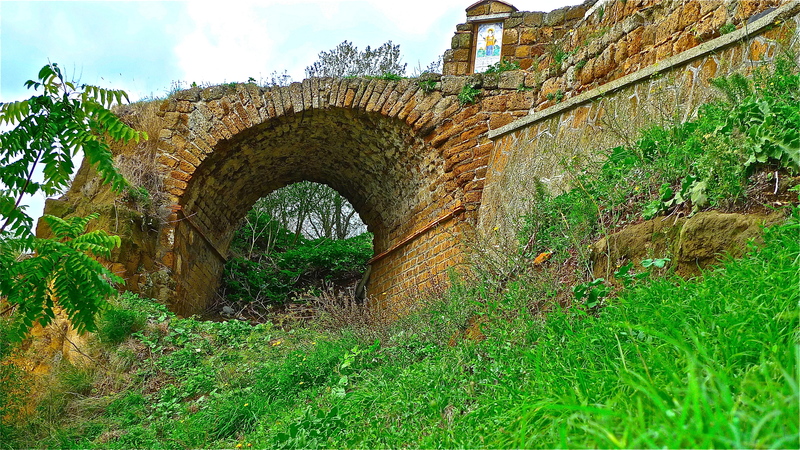 Ana Lucia – Thanks for taking the time to read “my side of the story.” Now, stop dreaming about it, grab your hat and coat and head to Civita, before it slides off into the abyss. You’re quite welcome. Too bad you didn’t ring me up. I’m down in Rome often, where my oldest daughter lives. Who knows, we might’ve been there at the same time. Opportunity missed. 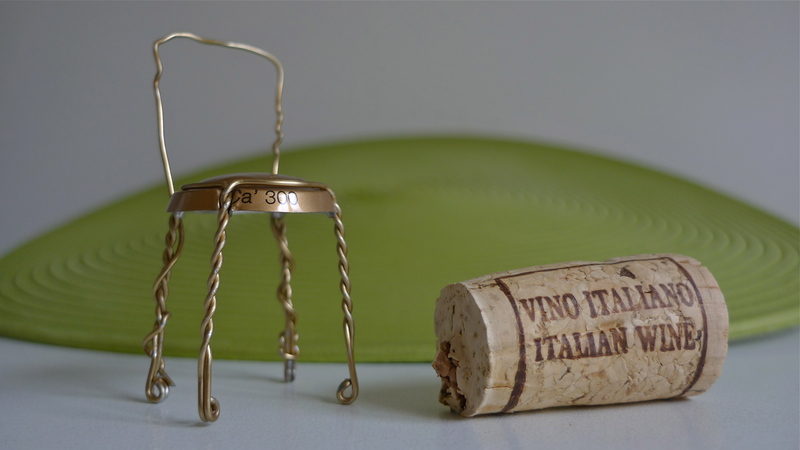 Ciao for now.